Words of the year are like codes that capture a wealth of information in our communication today. Shortlisting a ‘Word of the Year’ is an attempt to capture the zeitgeist of the year. American stalwart Merriam-Webster dictionary, recently announced “Feminism” as its word of the year, ahead of ‘complicit,’ ‘recuse,’ ‘empathy’ and ‘dotard’ — all closely related with events in 2017 around or in response to the Trump administration. The Oxford dictionary also reported both ‘feminism’ and ‘gender’ among its top viewed entries of the year, indicating that the struggle for gender equality remains a key issue of the day. Also featured on its top views list was the Hindi word, ‘Hijra’. The Merriam-Webster runner-up word, ‘complicit,’ did actually become the Word of the Year on dictionary.com in November. Describing their 2017 choice, the dot com dictionary commented: “It’s a word that reminds us that even inaction is a type of action. The silent acceptance of wrongdoing is how we’ve gotten to this point. We must not let this continue to be the norm. If we do, then we are all complicit.” The interest in ‘complicit’ notably spiked when Ivanka Trump said in April, “I don’t know what it means to be complicit” and once again in October when US Senator Jeff Flake announced that he wouldn’t be seeking a re-election citing a “flagrant disregard for truth or decency” in the Trump administration. An analysis performed by the Oxford University Press, revealed earlier in June, that ‘Trump’ itself was the Children’s word of the year when it was found that they were not only inventing characters – from aliens to superheroes – with the name of the 45th US president, but also blending his name with new prefixes and suffixes to create new words . Traditional dictionaries in the digital age have embraced a new alive and interactive online persona. The digital age, furthermore, generates a slew of new terms, slangs and fast-catching coinages to define new phenomena. No longer a one-way guide, these havens of word-nerdiness inform, entertain, offer commentary and analyse world trends and events (generally with a North American or UK bias). Word of the Year category is a one-stroke outlet to crisply perform all of these functions. “Fake news,” a pet invocation of Donald Trump for dismissing unfavorable reports, got acknowledged by the Glasgow-based Collins dictionary in November as the Word of the Year following what the dictionary referred to as its “ubiquitous presence” and a 365 per cent increase in its usage since 2016. While Trump did not invent the term, his manner of speaking and his vocabulary have found great imitation currency, which allows him to influence the English language. Also high up in the Collins’ list were ‘antifa’ (the trending abbreviation for “anti-fascist”), ‘echo chamber’ (a nod to conversation silos on social media), and ‘Corbynmania,’ (a reference to “fervent enthusiasm” for British Labour leader, Jeremy Corbyn). Global Language Monitor, which makes an effort to analyse English globally and worldwide, also named ‘Truth’ as the top word of 2017 because, “Let’s face it. The conversation is all about truth, or lack thereof.” Along with ‘post-truth,’ another big word across the spectrum, ‘truth’ too resonates with political contexts across the globe in 2017. The GLM runner up, ‘narrative,’ also pings back to a post-facts world of political spinning of yarn. 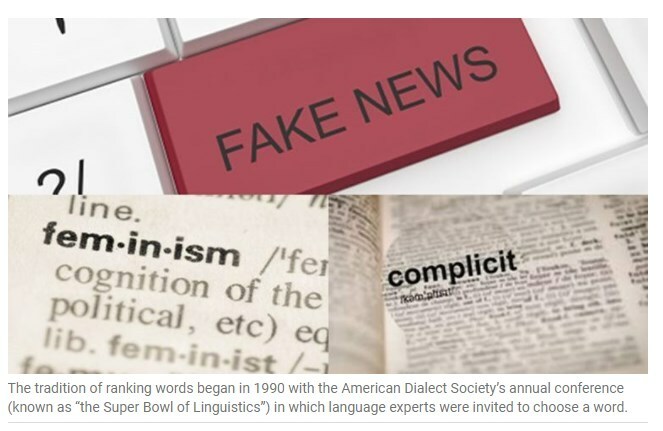 The tradition of ranking words began in 1990 with the American Dialect Society’s annual conference (known as “the superbowl of linguistics”) in which language experts were invited to choose a word. What’s in the ranking of words, one might ask. But consider this: In 1993, the winner was “information superhighway”. In 1997, “millennium bug”. In 2001, “9/11”. In 2007, “subprime” described a risky loan, and in 2008 “bailout” described the US government’s response to the financial crash caused by subprime loans. “Hashtag” was crowned in 2012 and 2014 was for ‘#BlackLivesMatter’. Together, they are a whistlestop line-up of some of the most defining shifts in the previous quarter century of the US. Words like ‘Feminism,’ ‘Fake news,’ ‘Complicit,’ ‘Truth’ indicate some on-going dilemmas and responses in the backdrop of politics and tumultuous issues like sexism, racism, terrorism and immigration. There is no single way to choose the word. One can talk about the feminism in #metoo and marches or the complicity that kept sexual harassment under wraps for decades to understand 2017. One can puzzle over ‘fake news’ in whatsapp videos or search for the truth in polarised media narratives. The point is that top words became like codes that can capture a wealth of information in our communication today.